CINeMA (Confidence In Network Meta-Analysis) is a web application that aims to simplify the evaluation of confidence in the findings from network meta-analyses. 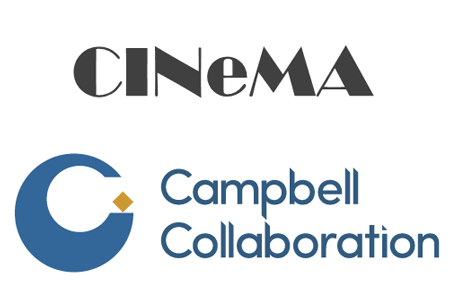 The Campbell Collaboration awarded a grant to CINeMA as part of its programme supporting innovative methods development. Policy makers and guideline developers face challenges in evaluating the quality of evidence from systematic reviews with multiple interventions. A framework was previously developed based on the GRADE (Grading of Recommendations, Assessment, Development and Evaluations) system, and can be used to evaluate the credibility of the results from network meta-analysis. Core aspects of the approach include considerations about the plausibility of the transitivity assumption underlying network meta-analysis and understanding the relative contributions of direct and indirect evidence. However, the process is cumbersome and time-consuming for large networks. The aim of this project is to develop a user-friendly web application (Confidence In Network Meta-Analysis, or CINeMA) that considerably simplifies the evaluation of confidence in the findings from NMA. Only study outcome data and study-level risk-of-bias assessments are required as input; with these, CINeMA produces graphical and numerical summaries of NMA output, indicating likely judgments for the five credibility domains. The team at ISPM includes Georgia Salanti, Theodoros Papakonstantinou, Adriani Nikolakopoulou, and Matthias Egger.